Overflowing gutters are a nuisance to your industrial property. Blocked gutters cease to fulfil their purpose when obstructions lodge themselves within the casing, and with winter well and truly here, the probability of an overflowing gutter is increased; thanks to the heavier fall of foliage, as well as a greater risk of damage due to more severe weather conditions. An overflowing gutter poses a risk not only to the buildings integrity, but also anyone at ground level. An overflowing gutter has a considerable buildup of debris and water, and if it fails, the gutter may injure someone below. For this reason, it is always advised that a professional gutter cleaning service is employed if you are suspicious that your gutters are overflowing. You should always refrain from inspecting your gutters yourself due to the health and safety implications involved. However, to help you know whether you definitely need a gutter cleaning service, below are indications of an overflowing gutter. A fascia board runs along the undercarriage of a gutter, fixing it to the building’s structure and aiding in tile support. Initial signs of a rotting fascia board include the discolouration and cracks appearing in the paintwork. This indicates that moisture has gained access to the board and it has begun deteriorating. This is particularly dangerous if your industrial property has roof tiles, as fascia boards prevent tiles from sliding off the roof, creating a potential hazard for people below. A very clear sign of an overflowing gutter is general discolouration of the building’s exterior. The accumulation of foliage, debris, and water produces discharge rainwater, capable of staining the exterior structure if the gutter overflows. If this continues, the moisture, as well as the concentration of bacteria in the rainwater, can impede the strength of the structure, which if left, will be irreparable. The greatest threats to pavements is rainwater. Gutters are designed to funnel rainwater away from the building and into a sewage system. If a gutter is overflowing, the rainwater is not following the dispensing route intended. Rainwater is then allowed to build up on pavements. During winter, this is particularly bad. Pavements absorb water, and when temperatures reach freezing, the pavement contracts and retracts, leading to cracks. An extreme indication of an overflowing gutter is flooding. Flooding is more than likely to occur outside the building. However, depending on the severity of the blocked gutters, water can gain access to the building. This can damage the building’s integrity, as well as the contents within. During bad weather particularly, an overflowing gutter is easily identifiable. If flooding has occurred as a result of overflowing gutters, and has not been treated immediately, water may have built up and gained access to the foundations of your commercial property. The excess water can soften the soil holding your foundations in place. As a result, cracks will appear on both internal and external walls, and areas of the building’s structure will become distorted. From ground level, determine whether or not you can see that your gutters are blocked. At times, due to general wear and tear, the pitch of gutters can tilt, making it appear blocked. Nevertheless, contact a gutter cleaning service who will provide a professional inspection. If your gutters have been deemed blocked and overflowing, the gutter cleaning service will first inspect downspouts, testing the severity of the blockage. The blockage will then be removed, and the gutters cleaned. To prevent future overflowing, splash guards and gutter helmets can be professionally installed, and will act as a shield to foliage and debris. 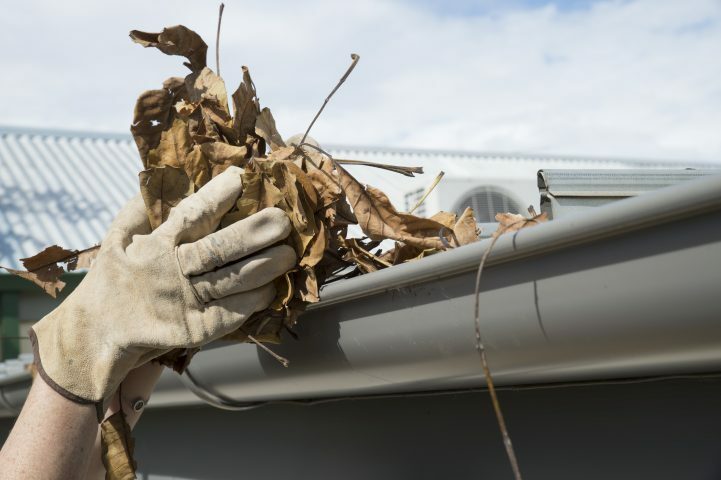 If however the gutters have been left to deteriorate for too long, and are beginning to affect the condition of other structural components, the gutter will need to be fully replaced. OUR NATIONAL GUTTER MAINTENANCE AND REGULAR GUTTER CLEANING SERVICE IS SECOND TO NONE! IF YOU’VE GOT A PROBLEM WITH YOUR GUTTERS THAT YOU’VE BEEN AVOIDING GIVE US A CALL ON 01748 529 154 BEFORE IT’S TOO LATE. STILL NOT SURE WE’RE THE ONES TO CALL? CHECK OUT OUR CUSTOMER TESTIMONIALS HERE.